Its not Over, Till its Over — Stay calm on sidelines. 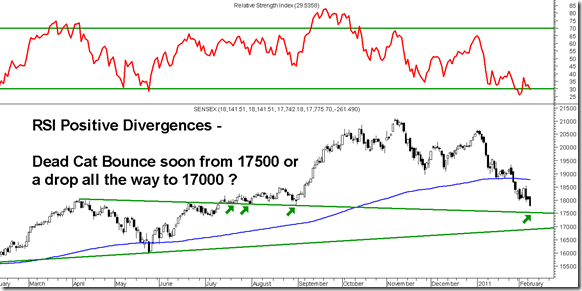 Sensex has come down to the band of 17700-17800 but not seeing any respite and in a downtrend one should not try catching a falling knife. Let the markets stabilize. RSI is giving signs of positive divergences but no other positives seen. Technically there is a minor support at 17500-17400 but the next major support comes at the lower trendline and the previous channel which is roughly placed at 17000. Major fibonacci retracement for the move comes at 16100. On the upside till we dont close above last 2 days high we cannot consider any positive momentum. For now such a level comes to 18200. Also markets on the upside may get limited to 18800 which was the breakdown level. As mentioned ever since 19900/19000 the view has been maintained to keep 50% or much higher cash for investors. Although the prices might be tempting right now but a breakdown below 17800-17700 also opens a possibility of a flash crash to lower levels with some negative announcements. Also its clear with the magnitude of the fall that markets may not get into a V shape reversal soon and investors may get opportunities to get back. So one may be very selective and continue to wait for turnaround signals. Buying a little higher is more comfortable then to catch a falling knife and get hurt. None of the supports have been respected so the correction is not over till its over. And when its over we will get good turnaround signals on technicals and market observations. Recently a few days back we expected a bounce back and had focussed on RIL, ICICI , SBI and Hindalco as best bets. Got a 5-10 % jump on Hindalco, SBI small move, RIL and ICICI we preferred to exit on cost as still not comfortable on turnaround signals. 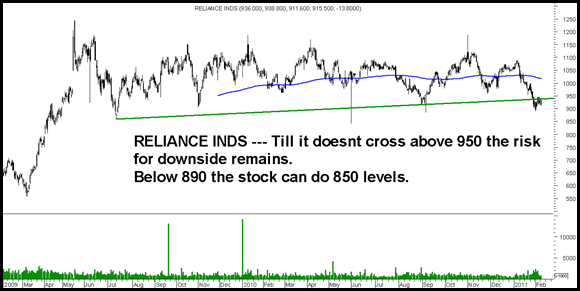 Reliance Inds as you see above after an initial move up could not cross was not a great signal. We may watch for a move above 950 to confirm positive moves. A move below 900-890 can even take it to 850. Many Banks like BOI, UCO bank, all bank , Yes Bank have given breakdowns and can head lower it seems. Short trades seem to be clear on technicals but the positive divergences on Index makes it a bit risky but momentum traders can keep looking for quick shorts. If you are not in the market all you can lose is an Opportunity, But Hanging around for no reason can cost you badly. 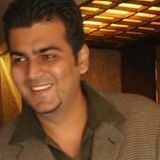 Dow Jones Bounces,VIX Falls & Nifty makes a new high. What next ? Hope you are doing good.. I’m writing to you after a long time.. Should I now go by saying – ‘ Buy when everyone is selling’ and take a risk?? I would say, be selective and SIP your selected stock. i am looking at 2 stocks as i am 100% in cash. BILCARE & RELIANCE CAPITAL. What are your views on these two stocks? look forward to your reply. Analyse YESBANK and ELGIEQUIP or WHIRLPOOL, that is good bet. Let us see what we see.Trader is trader he is never bull or bear . Remember elliot Wave ., At 6338 B was competed. and C started . first leg 6338 – 5690 . 2nd gave 74.6 percent retracement in zig zag manner . 5690 – 6181. Now 3rd in progress which could reach 5111 . which is 1.618 times 1 st leg . Sir If you can see hourly chart . every retracement and impulse have followed fibo. On an Elliot Basis my earlier assumption was B wave is not over till we confirm below 18800 which was done since 19900/19000 have been on very high cash. Majority of the readers are investors and not leverage traders or FNO participants. So view is with a bias of market outlook. The view is simple trend is down and we dont go fight it. When market was reaching 6338 volumes were low compared to earlier 6357 , which was indication that the move from 2250 – 6338 is B and not next uptrend . And now my view is nifty might come again till 2500. A = C ., within this year . Considering Global markets . are almost reaging their retracement levels . of 76.4. Dow 12400 , S & P 1360. Only indian market has given 100 percent retracement. Some stocks have given irregular top e.g. Sbi . As per Elliot tenets in case of irregular B , i.e. above 5 th wave top. correction should be sharp . same is the case of Sbi. .
All the above analysis is working well for me . Thanks to you for trading techniques . And thanks to Robert Beckman . for writing such a wonderful book giving in depth knoledge of EW analysis . I am achieving almost exast highs and lows of the moves. this is not a n advertisement of vision books. But I personally feel if a brilliant person like you study that book it would be very helpful for many people . Lets c i have a bullish count on Sensex and consider the triple correction got over in March2009. Will checkout that book let me know if u have an e book. Trend is weak there are no two ways about it. Well when a ship sinks everything goes with it so i would wait for markets to stabilize. Positive divergence is also violated today and RSI made lower low confirming downtrend. but as you said 17,500 or 17,000 we can expect bounce…. We need to watch for confirmation after divergences. Markets can remain oversold for longer time then we can think. My portfolio has become HALF . I have not booked any profit as you told that sensex will touch 23000 soon. Tell me whether 23000 will come in 2011 or not. Should I book losses or wait for your target. My view had been that Sensex may do a high again ! which dint go but being a trader/investor have advised to exit 50% + position for investors at 19900/19000 levels. For traders we took long exits at 19900/19000 completely. Also at 20500 i had advised people to exit leverage positions. The decision to sell is most difficult. For now 17800 is broken which was last hope. Now we may look to enter on panics only or on turnaround. technically logical level next is 16100 in worst case.